Last year when members of The Church of Jesus Christ of Latter-day Saints presented Toby Perkins with a voucher for 100 hours of Community Service within his Chesterfield Constituency, they were pleased when he requested Helping Hands for Staveley Cemetery as their annual community project. On Saturday 3rd of June, Bishop David Lawrance, with members and missionaries of the Chesterfield ward, aged from 7 to 81 years old, spent a sunny day in Staveley Cemetery. 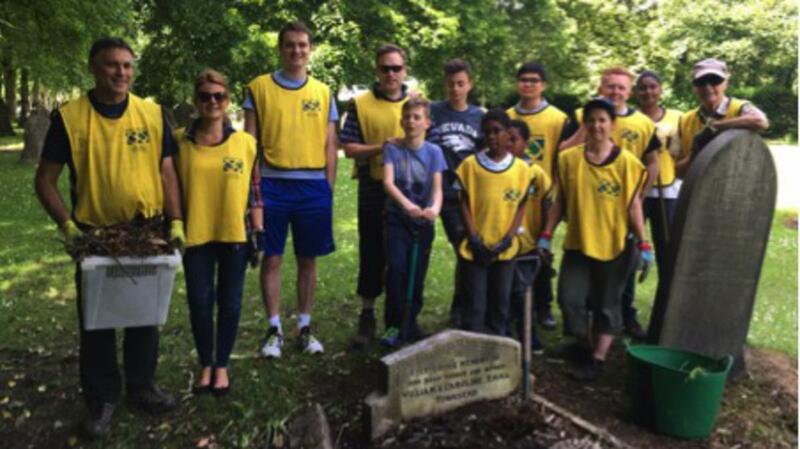 Church members cleaned moss from unreadable tomb stones, reassembled damaged or vandalised grave stones, planted bulbs and flower seeds and cut back branches where they obscured graves. Headstones were also photographed and uploaded to billiongraves.com making it easy for family historians to search for their family members with the information now secure and easily searchable online. Previous local Helping Hands projects have included cleaning, restoring and photographing over 1000 eroding sandstone grave stones with reverend Jo Morris at St Bartholomew’s church yard in Old Whittington, a “total” grounds makeover at the rear of St Patricks Church New Whittington, replacing fencing with Derbyshire County Council Rangers on the Chesterfield canal, helping perform maintenance for the Eyre Chapel Trust at Newbold and assisting a restoration with Bolsover Drama group. Helping Hands projects are also used globally in response to many emergency and disaster situations in conjunction with the Red Cross and other charities when teams of dedicated volunteers swiftly help in their local communities in many ways.